Apple revamped nearly the entire Mac laptop line during WWDC, leaving only the $999, entry-level white MacBook ( ) unchanged—and that model was revised just two weeks earlier. But while most models gained new capabilities, the 17-inch MacBook Pro was the sole Mac laptop that kept its design and feature set intact. Which isn’t surprising, considering it was just a few months earlier that Apple’s largest laptop joined its siblings in donning a unibody enclosure. Still, the company’s largest-screen portable improved its performance and upgrade options while becoming more affordable. The latest version of Apple’s pro-est pro laptop features the same basic features as the model that debuted at January’s Macworld Expo (and shipped in February). Along with its aluminum unibody enclosure and impressively long-life battery (more on that below), the laptop’s flagship feature is its 17-inch, mercury-free, LED-backlit display. Sporting a 1,920 by 1,200-pixel resolution, the screen is protected behind a thin sheet of arsenic-free glossy glass. The screen seems enormous, especially if you’re used to a 13- or 15-inch model, making it great for working with multiple windows or applications simultaneously. On the other hand, the screen’s high resolution means that items on the screen are quite small; I often had to enlarge the size of onscreen type, especially when browsing the Web. And while the screen produces exceptionally vivid colors and deep, dark blacks (this display uses the same 60-percent-greater-color-gamut technology Apple is touting on the smaller MacBook Pros) the frequent criticisms of glossy screens remain valid: If the laptop is positioned poorly, you end up with quite a bit of glare, and the large screen makes it that much more difficult (compared to smaller laptops) to reorient the screen to avoid that glare. For the anti-glossy folks, Apple still offers a $50 build-to-order option for an anti-glare, matte screen. The 17-inch MacBook Pro continues to feature dual video cards: the Nvidia GeForce 9600M GT with 512MB of dedicated memory, and the lesser-performing Nvidia GeForce 9400M which shares 256MB of system memory; you can easily switch between them to get better performance or battery life, respectively, although switching requires you to log out and then log back in. You still get a 1,066MHz front side bus, 4GB of 1,066MHz DDR3 memory (upgradeable to 8GB), an 8x slot-loading SuperDrive, Gigabit Ethernet, three USB 2.0 ports, a single FireWire 800 port, AirPort Extreme Wi-Fi (supporting 802.11n draft and 802.11a/b/g), Bluetooth 2.1 + EDR (Enhanced Data Rate), an iSight camera, a backlit keyboard, and separate audio input and output jacks (each of which auto-switches between optical-digital and analog). The MacBook Pro also includes built-in stereo speakers, a mono microphone, Apple’s MagSafe power jack, and a Kensington lock slot. All ports are located on the left-hand side of the laptop, with the optical drive slot on the right. 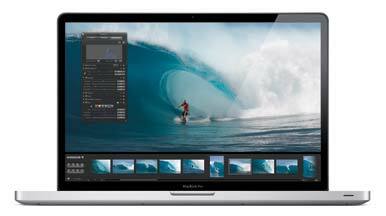 As with all current MacBook Pro models, the 17-inch model features Apple’s large, multi-touch trackpad. The trackpad makes multi-touch gestures easy-and fun-to use, although it requires an adjustment period for people used to a traditional trackpad with separate buttons. The physical click, which requires you to depress the entire trackpad, feels especially odd. Even after using a recent 13-inch MacBook with a similar trackpad for several months, I prefer the touch-sensitive-tap approach, which you can enable in Trackpad preferences. The MacBook Pro’s Mini DisplayPort jack supports VGA, DVI, and dual-link DVI video output using the appropriate adapter. Unfortunately, no video adapters are included, not even the basic DVI version, which will cost you another $29. Similarly, you can use an Apple Remote with the 17-inch MacBook Pro, but you have to pony up another $19 to get it. These omissions feel cheap given the price you’re paying for the computer. The 17-inch model retains the same dimensions as its short-lived predecessor: 15.5 inches wide, 10.5 inches deep, just under an inch thick, and 6.6 pounds. And unlike its 15-inch siblings, which now feature an SD-memory-card slot, the latest 17-inch MacBook Pro keeps the popular-with-pros ExpressCard/34 slot, making it the only Mac laptop with such expandability. So what did Apple change since February’s model? Not much, but those changes serve to make the 17-inch MacBook Pro a better value. First, the stock processor is now a 2.8GHz Core 2 Duo, up slightly from the previous model’s 2.66GHz. (Level 2 cache remains at 6MB.) Second, you get more storage in the form of a 500GB 5,400 rpm hard drive, up from 320GB. And that’s it on the hardware side. But while these are relatively minor changes, Apple also lowered the price of the laptop from $2,799 to $2,499—the same price as the best previous-generation 15-inch MacBook Pro—giving you a better computer for less money. It’s tough to argue with better value. Apple also improved the build-to-order upgrade options for the largest MacBook Pro. You can now bump the processor up to 3.06GHz for $300; the previous CPU upgrade, priced similarly, topped out at 2.93GHz. An upgrade to a 7,200 rpm drive with the same 500GB capacity is $50. And the cost of upgrading to a solid-state drive (SSD) is now lower: a 128GB model will set you back $200 (compared to $300 a week ago), and a 256GB model costs $650 (compared to $750 before). As you might expect (and saw earlier in our benchmarks analysis of all the new MacBook Pros), given the minor bump in processor speed, the latest 17-inch MacBook Pro doesn’t exactly leave its predecessor in the dust. In fact, for most tasks in Macworld’s benchmarking suite, the differences between 2.66GHz and 2.8GHz are barely noticeable—a few seconds here and there. The result is a Speedmark improvement of only 3 percent, from 249 to 256, compared to the February model. But that’s not necessarily a bad thing. In day-to-day use, the 17-inch MacBook Pro, like the latest top-of-the-line 15-inch 2.8GHz MacBook Pro ( ), offers impressive performance for a laptop. In fact, with the exception of hard-drive-intensive tasks, which are slowed by the 5,400 rpm laptop hard drive, moving from my Mac Pro to this MacBook Pro didn’t result in a noticeable drop in performance. That says a lot about the performance of Apple’s current notebooks. Speedmark 5 scores are relative to those of a 1.5GHz Core Solo Mac mini, which is assigned a score of 100. Adobe Photoshop, Cinema 4D XL, iMovie, iTunes, and Finder scores are in minutes:seconds. The two white MacBooks and the MacBook Pro were running Mac OS X 10.5.7 with 4GB of RAM. The Photoshop Suite test is a set of 14 scripted tasks using a 50MB file. Photoshop’s memory was set to 70 percent and History was set to Minimum. We recorded how long it took to render a scene in Cinema 4D XL. We used Compressor to encode a 6minute:26second DV file using the DVD: Fastest Encode 120 minutes - 4:3 setting. In iMovie, we applied the Aged Film Effect from the Video FX menu to a one minute movie. We converted 45 minutes of AAC audio files to MP3 using iTunes’ High Quality setting. We used Quake's average-frames-per-second score; we tested at a resolution of 1,024-by-768 pixels at the Maximum setting with both audio and graphics enabled. We duplicated a 1GB folder, created a Zip archive in the Finder from the two 1GB files and then Unzipped it.—Macworld Lab testing by James Galbraith, Chris Holt, and Helen Williamson. Similarly, the battery life of the latest model is essentially unchanged from its predecessor’s. But, again, that’s not a ding by any means. The 17-inch MacBook Pro’s battery life increased dramatically when Apple integrated its latest (non-removable) battery technology in the February model. That model clocked in at 4 hours, 20 minutes in our standard test, which involves looping a full-screen video file with the display at full brightness, Energy Saver settings set to never sleep, and using the lower-powered GeForce 9400M graphics. The latest model lasted almost exactly as long: 4 hours, 18 minutes. I also tested the MacBook Pro under lighter use, similar to that of Apple’s official battery testing: surfing the Web over a wireless connection and using office-productivity apps, such as Microsoft Excel and Word, with the display set to half brightness. (During this test, there were occasional periods where the laptop wasn’t actively being used; however, the computer and screen never went to sleep.) Under those conditions, the 17-inch MacBook Pro ran continuously for a jaw-dropping 8 hours, 20 minutes, which should be long enough for many people to overlook the fact that they can’t swap the battery in the field for a fresh one. And because of the technology in this battery, Apple says it should last for around 1,000 charges, enough for about 5 years of typical use. The latest 17-inch MacBook Pro is by all measures a minor hardware upgrade over its predecessor, offering only slightly faster processor options and a bump in hard-drive capacity. The more significant change is the value you get for your money: Apple has dropped the price of the computer by $300 and similarly reduced the price of build-to-order upgrades. If you purchased a 17-inch MacBook Pro after February’s unibody introduction, there’s little reason to upgrade now—or to regret your earlier purchase. But if you’ve been on the fence about splurging for the monster of all MacBooks, the decision to buy just got easier: this is the fastest Mac laptop ever, at the lowest price Apple has ever charged for a top-of-the-line notebook. This lower price also makes the 17-inch model more appealing to those considering the 15-inch MacBook Pro but who truly need an ExpressCard slot or who prefer a matte screen, as this is, sadly, the only Mac laptop still offering those features. And while moving up to the 17-inch model means lugging around a considerably larger machine, you also get incredible battery life and a screen big enough for this to truly be a desktop replacement. The latest 17-inch MacBook Pro is by all measures a minor hardware upgrade over its predecessor, offering only slightly faster processor options and a bump in hard-drive capacity. The more significant change is the value you get for your money: Apple has dropped the price of the computer by $300 and similarly reduced the price of build-to-order upgrades.